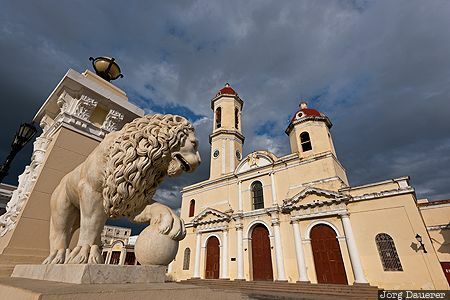 The Lady of the Immaculate Conception cathedral in downtown Cienfuegos with the statue of a lion in the front below dark clouds. Cienfuegos is the capital of the province Cienfuegos in the south west of Cuba. This photo was taken in the afternoon of a cloudy day in March of 2016. This photo was taken with a digital camera.